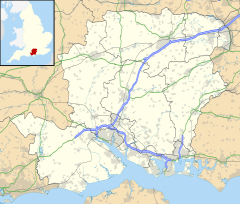 Langrish is a village and civil parish in the East Hampshire district of Hampshire, England. It is in the civil parish of Stroud. It is 2.7 miles (4.3 km) west of Petersfield, on the A272 road. The nearest main railway station is Petersfield, 2.3 miles (3.7 km) east of the village. Work was done at Langrish House, later a hotel, on parts for making Concorde's nose-cone. Langrish has been host to the British Sidecarcross Grand Prix a number times and hosted it again in 2012, on 26 and 27 August. ^ "Civil Parish population 2011". Neighbourhood Statistics. Office for National Statistics. Retrieved 5 January 2017. This Hampshire location article is a stub. You can help Wikipedia by expanding it. This page was last edited on 12 June 2018, at 08:50 (UTC).